Marcellus Shale gas development has been happening safely in Pennsylvania for the better part of a decade. It’s not only happening on private property, but also on state forest lands, which seems to irritate some people who should know better. For example, some anti-growth folks have been demanding that shale gas development be banned in Loyalsock State Forest, but it’s just too hard to take them seriously: Given the experience of the Department of Conservation and Natural Resources (DCNR) in safely managing oil and gas development in state forests, the notion that such development poses an unacceptable risk is simply not credible. 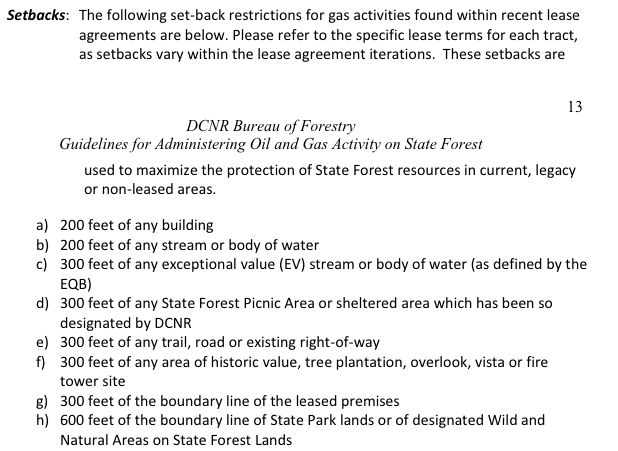 Consider: Since 2008, DCNR has approved 211 well pads and 842 shale gas wells on state forest land. Loyalsock State Forest is 114,494 acres in total, and the area that would potentially see shale gas development is located in a 25,000-acre section known as the Clarence Moore Lands (the actual surface land that would be used would be considerably less than the 25,000 acres). Two shale gas exploration and production (E&P) companies have already leased 7,000 acres of this land. When it comes to resource development on state forestland, DCNR indicates it takes the approach of avoid, minimize, mitigate and monitor. The agency works hand in hand with companies operating on state land to ensure the process is done safely and with the correct safeguards in place. If it can’t be done safely, then it won’t be done. That’s just a fact. Avoid – Through early and comprehensive planning the Bureau utilizes a landscape-level perspective for the placement and location of infrastructure, to avoid impacting ecological or recreational resources. Minimize – Each activity on State Forest lands goes through a review process to minimize potential impacts to plant and animal species, habitats, or recreational resources, when avoidance is not a suitable option. Mitigate – After disturbance activities conclude, mitigation will be necessary to offset adverse impacts to forests. Mitigation can be accomplished in several ways—but always must comply with state erosion and sedimentation control requirements. Monitor – As the infrastructure is built, monitoring is necessary to document both positive and negative changes to State Forest lands. Monitoring efforts will focus on plants, wildlife, water resources, social, and recreational values. These four points succinctly summarize 165 pages of detailed guidelines that DCNR places on any company operating on state forest land. These guidelines work to assure that resources can be extracted in a safe and responsible manner – from conception of the project to the end, DCNR provides strong oversight to ensure everything is done correctly. Seneca Resources has been developing shale gas on state forestlands with strict oversight from the DCNR for years. Through innovation and advances in technology, they have been able to produce a resource from over a mile below the surface with only minimum disturbance. Opponents of oil and gas development in state forests are concerned with the amount of truck traffic, which is a valid concern. However, if we look at current practices of operators like Seneca Resources, we can see that through state of the art water withdrawal, storage systems and logistics plans, they have actually taken 70,000 trucks off the road during operations and minimized surface impacts. The setbacks in place ensure no trails are disturbed during resource development. With these strict setbacks in place, we are able to extract valuable resources that actually pay for recreation provided by DCNR while continuing to use state forest lands for that purpose. Effective resource management does not mean writing everything off as wilderness that can never see development. There is value in wilderness and the public forests, and that value is derived from a variety of uses that can occur simultaneously: recreation, hunting, and energy development. This well-accepted understanding of “wise use” and conservation traces its origin to at least a century ago. Perhaps the single-minded folks coming out to meeting to stop resource development should broaden their horizons a bit. They would discover that the Commonwealth has a clear record of safety in multi-use activities, including the use of public forests for recreation and responsible energy development, and that such activities have financially supported (through lease and tax revenue) improved access to the forests themselves.